Finding a natural shampoo that works well for you is a very hard task, at least in my experience. I've tried several over the last few years, some horrible and some OK. I've been pretty happy with what I had been using recently but when I heard about Nine Naturals, I knew I had to give it a try. For beauty, we know that moms want to look and feel good during pregnancy. So each of our products is designed to address your special needs. Our natural plant oils hydrate and soften, wheat proteins bring extra shine and pure mint helps fight fatigue. For baby, pre-natal safety is your number one concern. So, we kicked out the chemicals that are suspected to cause harm. That means no parabens. No phthalates. No sulfates. No DEA. EVER. We don’t compromise on this. There are chemicals in many beauty products that can lead to birth defects or act like hormones that interfere with the normal reproductive system. You don’t want that and neither do we. We set our standards high so that you can be assured that no matter which Nine product you use, you are doing all that you can to err on the side of caution. All Nine Natural products are free from sulfates, parabens, phthalates, silicone and DEA. Isn't that comforting to know? They are also Vegan and cruelty free. So I have to admit that I was a bit skeptical of these before I tried them. For starters, the minty scent had me a little worried. I am not really a fan of mint, I am more of a citrus kind of girl. But I was truly presently surprised by the mint scent of Nine Naturals. The majority of days I end up showering at night once all the boys are in bed. The invigorating mint definitely gives me a little wake up. And I love that the scent lasts in my hair for quite a while. Second is that this is a "moisturizing" shampoo and conditioner and I have pretty oily hair. This is one of the reasons why I have such a problem finding a natural shampoo that works for me. However, I am absolutely having no oil issues with Nine Naturals and I have been using it for 2 weeks. If you have tried natural shampoos before then you know that most do not lather very well. Now I know this is no indication of whether or not the shampoo is effective, but I personally NEED that lather to work it through my thick hair and for me to feel clean. Combine low lather with our hard well water and well, I end up using more shampoo then I should. In contrast, the Nine Naturals shampoo lathers very well, better than other natural shampoos that I have tried. And the lather is very thick, which I love. There is no need for me to use extra shampoo or for me to wash a second time, which I had been doing in the past. I am definitely very happy with my Nine Naturals shampoo and conditioner and plan on using them for a long time. Great stuff! 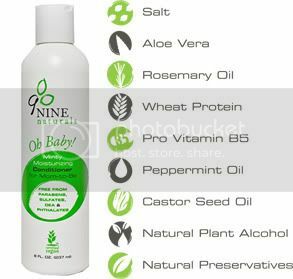 Nine Naturals Moisturizing Shampoo and Conditioner may be purchased at DueMaternity.com. One winner will receive a set of Nine Naturals Moisturizing Shampoo and Conditioner. Visit Nine Naturals and tell me something that I did not mention here. - Follow GreenMamasPad and Nine Naturals on Twitter and and tweet this giveaway. You can tweet once daily. Leave link to tweet in comment. - Become a fan of Nine Naturals on Facebook. This giveaway is open to US Residents 18+ only and will end on Wednesday, November 25th at 11:59pm EST. One winner will be chosen at random using Random.org. Winner has 48 hours to claim his/her prize otherwise a new winner will be picked. You must leave your e-mail address in all of your comment(s) so I can contact you. I will not share your e-mail address with anyone, it will strictly be used to notify you if you win. Good luck! Please note that the opinions and views expressed in this review are my own and based on my personal experience with the product. You may encounter a different experience with this than I did. Nine Naturals provided me with items for review and is providing the items for the giveaway. Nine Naturals has a Body Wash that is coming out soon and I bet that is just as wonderful as the rest of their products. If you buy the gift set, shipping is complementary! If you buy the gift set shipping is free. I learned that there are chemicals in many beauty products that can lead to birth defects or act like hormones that interfere with the normal reproductive system, and that they have a gift set that you can buy. Shipping is free if you purchase the gift set. i learned that they offer a quiz to find out What Kind of Mom You Will Be and have the chance to enter their $250 Great Mom Give-a-way -- thank you for the chance! Looks like Nine Naturals has been mentioned on MSN ... cool! Shipping is free with the purchase of the gift set. Thanks! You can take their quiz to be entered to win a $250 beauty giveaway! All sales are 100% refundable if for any reason you are disatisfied. sulfates are an inexpensive, harsh detergent that is frequently used in shampoos and body washes-it is used to help make foam and can actually dry out your hair in addition to doing other damage. all sales are fully refundable! when you buy the gift set shipping is free. yeah this shampoo look awesome!!!! "But this harsh chemical (sulfates) is also linked to skin irritation, hair loss and impaired hair growth." I'm thinking of ordering the gift set, cuz the shipping is F-R-E-E! I learned that over 90% of cosmetic products contain parabens. Yes. We've worked hard to make sure that all products are certified vegan which means we don't test our ingredients or our finished products on animals. I'd llike to try their new body wash when it becomes available. Naturals does not contain any parabens. I learned that they worked hard to make sure that all products are certified vegan which means we don't test our ingredients or our finished products on animals, thanks! 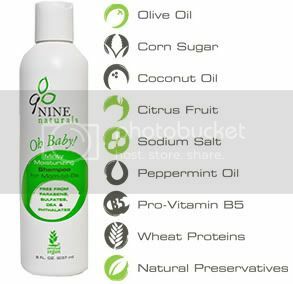 The "nine" in the name Nine Naturals refers to the nine months of pregnancy. I had learned that estimates show that over 90% of cosmetic products contain parabens. I'm glad that every Nine Naturals product has nine or fewer natural ingredients! This product has no paraben's 90% of cosmetics do. Complementary shipping with the gift set. "Some studies show correlations between these abnormalities and mothers who have greater exposure to these chemicals during pregnancy, through everything from hair spray to the water they drink. *"
If you buy the gift set shipping is free! I learned that there is also a gift set available. They have a body wash they are going to have available soon which my hubby would love! I learned that several recent studies link many common chemicals to serious health risks for the fetus and newborn because they act as endocrine disruptors. I am a Facebook fan of Nine Naturals (Aimee Waerhouse). if you buy the gift set, shipping is free. I learned that there are chemicals in many beauty products that can lead to birth defects or act like hormones that interfere with the normal reproductive system. Shipping on this great gift is complementary. Send one to your favorite expecting or new mom to let her know you are thinking about her. I found out that they have a NY Times link relating to their products that says, "Some studies show correlations between these abnormalities and mothers who have greater exposure to these chemicals during pregnancy, through everything from hair spray to the water they drink." I learned that there are chemicals in many beauty products that can lead to birth defects or act like hormones that interfere with the normal reproductive system. How scary! Over 90% of cosmetic products contain parabens..